This week we’ve been looking at the audio animatronics in Disney World starting with the history and then the retired AAs. Today we’re going to talk about classic audio-animatronics. These include everything from the very first AAs to some that are newer. These are all pretty standard when it comes to the technology, but they’re still worth discussing because they’re interesting in their own right! 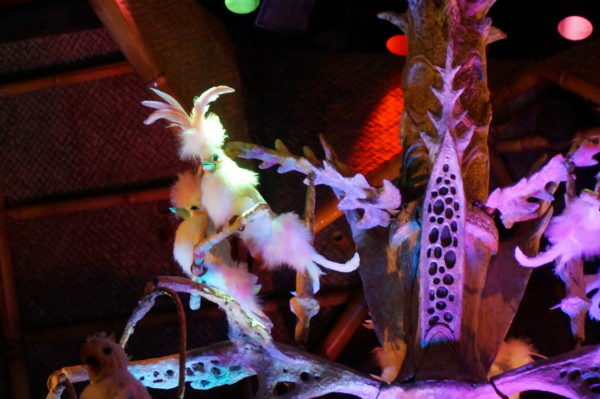 The Enchanted Tiki Room puts on display the audio-animatronic technology that started it all and was the first to do so. 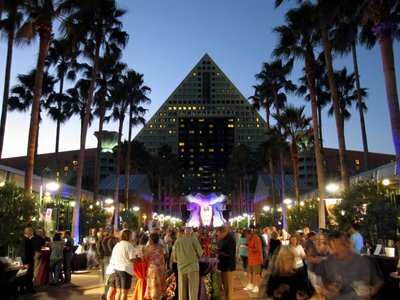 There are around 150 audio-animatronic birds and flowers all with a tropical theme. It opened in 1963 in Disneyland and was an opening day attraction in Disney World’s Magic Kingdom in 1971. These birds are beautiful, and they’re not even real! The birds and flowers sing and their eyes and faces move to create a really fantastic show. These AAs are not super advanced, but they’re one step above the Mr. Lincoln AA. The birds and flowers here are electromechanical, which means their pneumatic movements are triggered by sound, and they don’t use oil that could drip down onto the audience. Jungle Cruise was an opening day attraction at both Disneyland and Disney World. Walt was actively involved in the creation of this attraction; he originally wanted live animals in the attraction, but his Imagineers cautioned that they could not predict or control the movements and actions of live animals – not to mention the danger that live animals posed to guests. Instead, Imagineers used audio-animatronic animals including a hungry crocodile, an elephant that sprays water, playful gorillas, and angry hippos among others. Using AAs in this attraction allowed Imagineers to use the animals as part of the story instead of creating a story around the animals’ natural movements. Hall of Presidents started very small as Great Moments with Mr. Lincoln at the 1964 New York World’s Fair. Mr. Lincoln was the world’s first human figure in audio-animatronic form. Even as Lincoln was still performing at the World’s Fair, Disney’s Imagineers started creating another Mr. Lincoln who would join the lineup at Disneyland. A version of this show is still performing today. But Walt’s ultimate vision with this show was to create an entire attraction that included all of the US Presidents. This vision was realized when Magic Kingdom opened on October 1, 1971. Every president appears in audio-animatronic form and some of them speak. To create a more lifelike feel, every president since Bill Clinton has lent his own voice for his character. it’s a small world (yes, all lower case letters) was also an opening day attraction in Magic Kingdom that predated Disney World. This attraction was a World’s Fair project as well. It was housed in the UNICEF pavilion and sponsored by Pepsi, but Disney’s team only had 11 months to conceptualize and build the attraction. Mary Blair was the artist for the attraction, and she became known for her cartoonish design and bright colors mostly because of this attraction. (Blair also provided creative input to many Disney films like Cinderella, Alice in Wonderland, and Peter Pan.) Even more Disney legends, the Sherman Brothers, worked on the song now known around the world, “it’s a small world (after all)”. 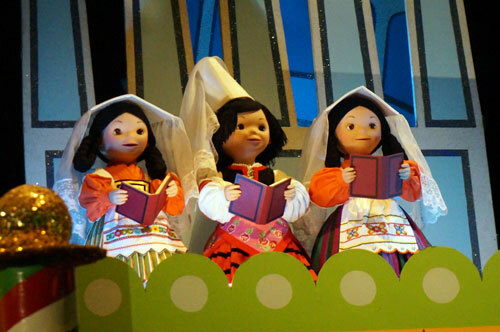 it’s a small world is truly a classic audio animatronic attraction! Together, these artists created an attraction that conveyed peace and brotherhood in a world that desperately needed that message. Today, over 300 singing and dancing dolls perpetuate the original goal, and the song has remained non-copyrighted so anyone can use it anytime they want! The Carousel of Progress is the last World’s Fair attraction on this list. After the attraction closed in New York, it was disassembled and moved to Disneyland until 1973 when it was disassembled and moved again to its current home in Magic Kingdom’s Tomorrowland. The star of the show is the audio-animatronic dad of the family. The show takes guests through technological advancements starting at the turn of the 20th century with the automobile, iceboxes, and the washing machine to name a few. The 1920s brought Dad a radio, the sports stadium, and indoor plumbing. He was very happy that the ’40s introduced the television, and he was proud that his wife had a food mixer and a dishwasher. “Today,” dad brags about the voice activated oven and lights until the turkey burns and smokes out the house. The technology behind the dad is not technologically impressive or advanced (since he is the original AA from the 1960s), but he is pretty animated when the Thanksgiving turkey catches on fire. His whole family, including his wife, two kids, his mother, and his dog are all audio-animatronic and contribute to the overall effectiveness of the show. 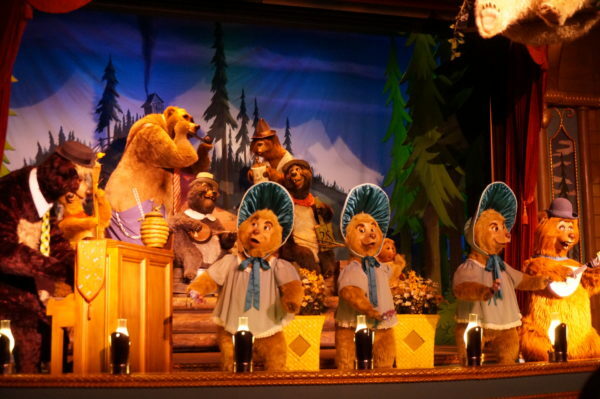 Country Bear Jamboree was originally intended for a ski resort in California, but the resort never materialized. Instead, Imagineers decided to put the attraction in Disney World. The country theme fit well into Frontierland, and it was nearly ready to start construction. Country Bear Jamboree performs a musical number with audio animatronic bears and other animals, and it’s pretty entertaining! This show is really cool because it’s almost entirely run by audio-animatronics on a stage. Henry, a large brown bear, is the Master of Ceremonies; he has lots of personality and is very animated. Liver Lips McGrowl provides the comedic relief, Wendell is very active and plays the mandolin while Teddi Berra never appears on stage but lowers down from the ceiling instead. Ernest plays the fiddle, Terrance and Big Al plays the guitar, though Al’s is a little out of tune, and Gomer plays the piano. Every bear except Gomer sings, and The Five Bear Rugs sing and play instruments too. Baby Oscar appears with the Bear Rugs, but he doesn’t play an instrument or say thing. There are also audio-animatronics mounted on the wall Including Buff, a buffalo, Max, a whitetail buck, Melvin, a bull moose, and Sammy, a raccoon. All of these AAs work together to create a fun, country-themed show that is quite entertaining for guests of all ages! Haunted Mansion in Magic Kingdom is home to 999 happy haunts and some really cool audio-animatronic technology. Many of the ghosts in the Haunted Mansion are done with projection, but there are several audio animatronic ones including a coffin that opens and closes with noise, a knight, and the floating head. Then, in the ballroom, there are dozens of dancing ghosts twirling just above the floor, and in the cemetery, there are even more ghosts dancing, playing instruments, and singing. 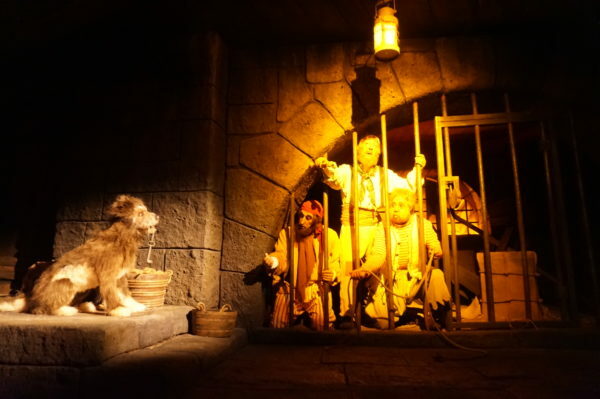 Pirates Of The Caribbean was the last attraction that Walt Disney himself worked on. The first Pirates of the Caribbean opened in Disneyland in 1967, three months after Walt died, then it opened in Adventureland in Magic Kingdom in 1973. The first movie came out in 2003, and since 2006, Disney has added characters from the movie to the attraction. All told, there around 120 audio animatronic characters throughout the ride including 53 animals and birds and 75 pirates and villagers. Pirates of the Caribbean had dozens of audio animatronics to tell the story of the unfortunate pirates! If you happen to see an animatronic that looks more human like than the others, you just might see the real Captain Jack Sparrow played by Johnny Depp who occasionally visits Disney Parks and loves to appear as his character inside the attraction. Some attractions have audio-animatronics so well hidden that you don’t even realize they’re there. Big Thunder Mountain Railroad is one of those attractions. It took nearly a decade for the idea of Big Thunder Mountain to become a reality. The attraction is located in both Disneyland and Disney World, and the mountains are mirrored. This means when the east coast track turns right, the west coast track turns left; they are nearly identical in every way. So where do the audio-animatronics come in? There are a few AAs scattered throughout the attraction in animal form like the goat that bleats, mules, and a snake. This is a classic use of audio-animatronics; they complement the landscape completing the story without taking away from the overall look at the attraction. Living with the Land fulfills the original goal of Epcot to provide educational opportunities in a fun way that are accessible to everyone. Specifically, this attraction deals with conservation of our natural resources and sustainable farming. This dark boat ride takes guests through different biomes starting with a tropical rainforest, a desert, and the American prairie. The prairie scene features audio-animatronic humans and animals to complete the scene. In total, there are 35 AAs in this attraction including a crocodile in the rainforest scene, a buffalo just before the prairie scene, and roosters, chickens, and goats on the farm in the prairie scene. The dog sitting on the front porch is a nice touch of “The American Dream”. Spaceship Earth at the entrance of Epcot is truly a classic attraction in the park. It was there on opening day, and it takes riders through the development of communication from prehistoric man, the alphabet, the printing press, telecommunications, and mass communication. 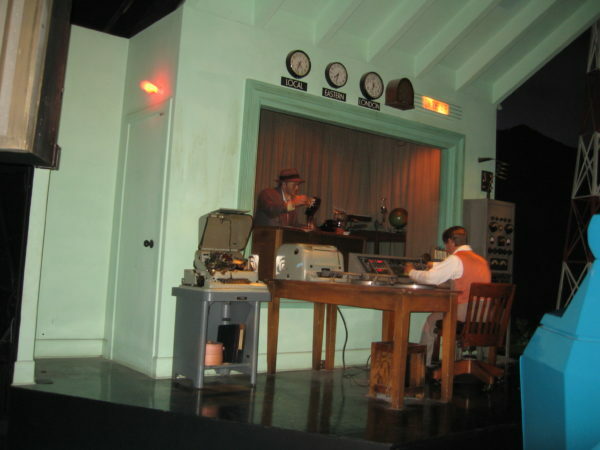 This scene in Spaceship Earth depicts an early radio broadcast, which is part of the larger story of the evolution of communication. Each scene uses audio-animatronic characters to tell the story of how communication developed through the centuries. There are animatronic cavemen, early humans, Phoenicians, Renaissance figures, and finally modern humans like the computer engineer at the end. These animatronics are not very advanced, but they function well to tell the story! Journey Into Imagination has gone through many versions since it opened less than a year after the park’s debut. 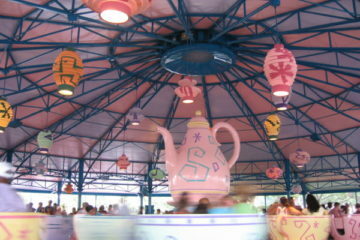 Each version has been a little different, and the pavilion has drawn some controversy for its inclusion, or lack there of, of Figment. Figment, as in “figment of imagination”, is a small purple dragon who lives in the Imagination! Pavilion, but he really became something of an unofficial mascot of the park. Originally, Figment was “created” during the attraction by Dreamfinder. Dreamfinder dreamt up this purple Dinosaur with “two tiny wings, eyes big and yellow, horns of a steers, but a lovable fellow” at the beginning of the attraction, and people loved him! In a renovation that opened in 1999, Figment was all but removed from the attraction, and fans were outraged so much so that this version only lasted a couple years, and Disney had to renovate it again. The latest version opened in 2002, and Figment plays a critical role. Sometimes he appears on a screen, and other times he appears as an audio animatronic character, but he can be seen in every room in the attraction now, which is a welcome relief to many Figment fans! Star Tours is a 3D motion simulator attraction that has recently been updated to include new characters and stories. C3PO and R2-D2 appear in the queue and interact with each other and guests. These two characters are lots of fun, just as you would imagine they are! You can also see C3PO in your Star Tours Star Speeder. Muppet*Vision 3D is a theater show directed by Jim Henson, the creator of The Muppets, and written by Bill Pardy. The title calls it 3D, but it’s actually 4D, and often referred to as such, because of some special effects like when Fozzie Bear uses a flower that sprays water and when bubbles are blown from the ceiling during Miss Piggy’s number. There’s nothing like a Muppets performance! Most of the show is a 3D film, but there are some audio-animatronics to complement the film characters. First we see Statler and Waldorf as audience members then a penguin orchestra. The Statler and Waldorf appear throughout the show, and the Chef appears as an AA at the end to shoot a cannon at Waldo when he’s supposed to be controlling the film camera. Overall, the show is funny with some silly jokes and “cheap 3D tricks”, and it’s enhanced with the audio-animatronics. Splash Mountain is another one of Disney’s classic mountain attractions. 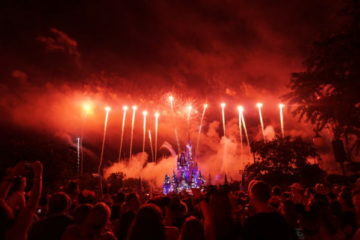 It operates in three Disney Parks worldwide, and it opened in Magic Kingdom in 1992. Splash Mountain is a really fun loge flume ride with a pretty relaxed beginning and a huge 50 foot climactic drop at the end. The ride is themed for Disney’s 1946 film Song of the South and includes the movie’s characters. Br’er Rabbit is being chased by Br’er Fox and Br’er Bear, but Rabbit sets traps for the antagonists who are awfully curious. All of these characters are represented by audio-animatronics who dance and sing the well-known Zip-a-Dee-Doo-Dah song. 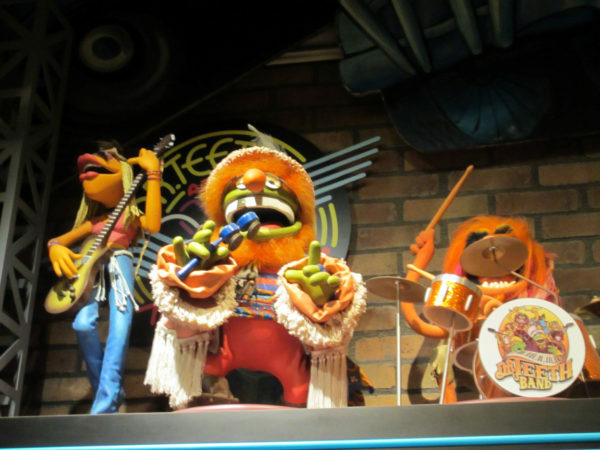 There are even more audio-animatronic animals who contribute to the chorus and to the fun, whimsical feel of the ride. 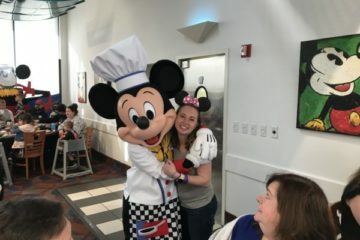 Cosmic Ray’s Starlight Café is the only location on our list that is a restaurant instead of an attraction! 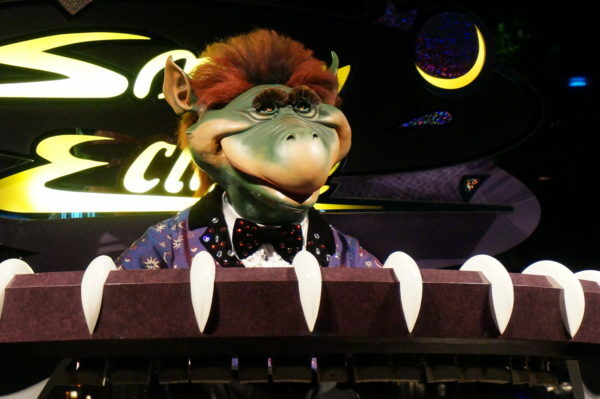 Inside Cosmic Ray’s is Sonny Eclipse, an audio animatronic lounge singer who performs throughout the day. He isn’t very high tech, but he has expressive facial expressions, and he moves his arms to “play” his piano. His movements result in a charismatic performance that is both realistic and out of this world, enjoyable and whimsical at the same time. Dinosaur, in Disney’s Animal Kingdom, starts in a museum and then transitions to a lab where guests are picked up by a rover and travel back to prehistoric times. Your mission is to rescue an Iguanodon before an asteroid strikes and triggers the extinction of dinosaurs and bring it back to the modern day to study it. Throughout the attraction, guests see a variety of audio-animatronic dinosaurs including a Styracosaurus, an Alioramus, a Parasaurolophus, a Velociraptor, a Carnotaurus, a Saltasaurus, a Coloborhynchus, a Compsognathus, and finally the Iguanodon that you’re searching for. 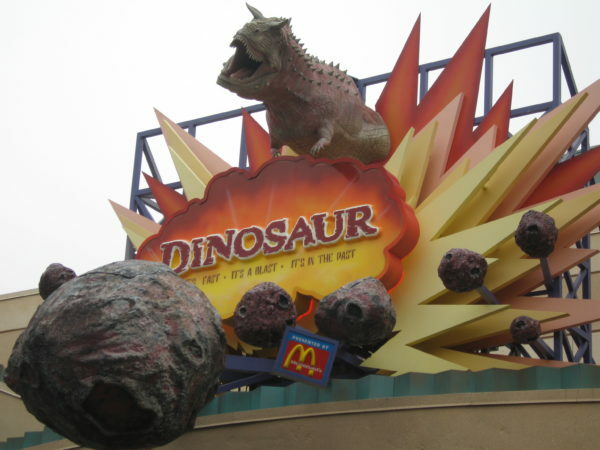 If you or anyone in your family likes dinosaurs, this is definitely not an attraction to miss. They are quite lifelike and really take advantage of the audio-animatronic technology. Dinosaur features large dinosaur animatronics that are pretty lifelike and can be kind of scary. Mickey’s Philharmagic is supposed to be a theater performance of some of Disney’s best music, but anytime Disney characters are involved, things tend to go awry. From the beginning, Donald causes trouble, but when he decides to try on Mickey’s sorcerer hat, things take a turn for the worse. The instruments come to life, and Donald can’t control them. Through all the craziness, we hear some of our favorite Disney songs like Part of Your World, I just Can’t Wait to be King, and A Whole New World. Mickey eventually returns, regains control, and conducts the orchestra, but Donald ends up getting stuck in a tuba, which launches him head first across a theater. Until this point, everything in the show has been done via projection; when Donald gets launched across the room, though, he gets stuck in the back wall. This is done via audio-animatronic even though you only see his feet. He kicks and writhes a little bit and eventually falls through the hole into the wall. The Gran Fiesta Tour Starring the Three Caballeros is housed inside the large pyramid at the Mexico Pavilion in Epcot’s World Showcase. The Three Caballeros are a band made up of Panchito Pistoles, Jose Carioca, and Donald Duck. The first two quickly realize that Donald has run off (there’s Donald causing trouble again). As the other two go to look for him, we see that Donald has been touring Mexico. 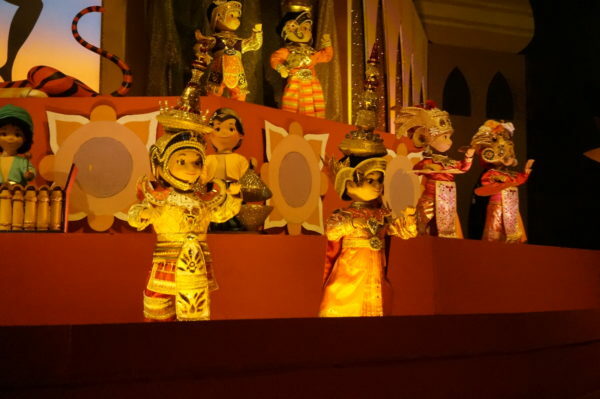 One scene that the boat travels through is similar in style to it’s a small world with audio-animatronic kids singing and dancing and Day of the Dead skeletons dancing and playing music on top of an arch bridge. Which Disney attraction uses audio animatronics the best?